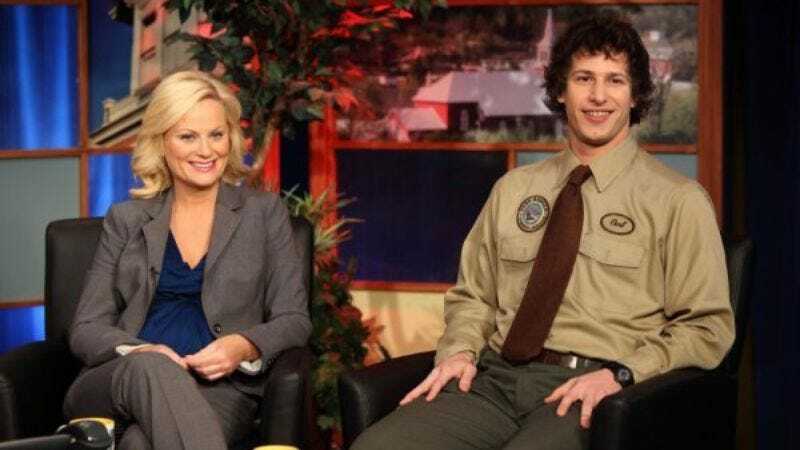 Parks And Recreation: "Park Safety"
Before I get into tonight's slapstick-heavy episode, here's one thing that really bothered me about the episode: Andy Samberg wasn't used well. He plays a park ranger who oversees a section of Pawnee where Jerry—the office buffoon—was mugged and injured, and for some reason he talks really loudly, all the time. Like, full-on shouting. There's a joke that Tom Haverford makes in one of his testimonials that this guy can't hold an office job because, well, [cue silence and hearing Andy Samberg shouting from behind a closed door]. And there's a line near the end when Leslie confronts him at the TV taping, where she asks him to speak quietly to her because she has a proposition—to which he shouts "Yes I will sleep with you." Those jokes were fine, sort of one-and-done. The whole middle section, though, where his character takes them around to the scene of the crime, points out the raccoon piss-soaked golf cart he's forced to drive…oy. I almost wish he wasn't in those scenes, to be honest. Samberg's a really funny guy normally, but to force him to play over-the-top in every scene was a lot, even for a comically cartoonish show like Parks & Rec. Other funny people have had their share of good luck in their roles, notably Will Arnett and Megan Mullally; sadly, twas not the case. But the good far outweighed the bad, as you'd expect from an episode about Jerry. Oh, how the office loves to torment Jerry for his clumsiness, his weight, his inability to maintain an erection long enough to "walk Lord Sheldon" (presumably)—they laugh and laugh! Then after the aforementioned mugging and shoulder dislocation, the office makes a pledge to be extra nice to him. Cue one of the most amazing scenes in Parks & Rec history as the office struggles to keep it together as Jerry tries to give a presentation. He accidentally shows a photo of him on his vacation in Muncie, Indiana—where he has a time share. He flubs up all his lines. He trips, almost falling. He bends over, his pants rip, and he rips one good. The look on Donna's face alone was enough to bump that scene to legendary status. It turns out, though, that Jerry made the whole thing up to cover an even more embarrassing injury: falling into the creek by trying to eat a breakfast burrito. For a second, we get a glimpse of the man behind the mockery. He can take the torment normally; he knows what he is. He just doesn't want to be made fun of for this one thing, and Leslie can accept that. 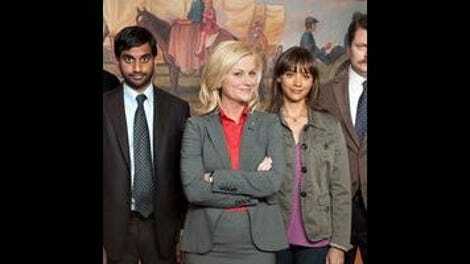 She even lies to her government and to the people of Pawnee just to cover it up. But she still has to get one more laugh in watching Jerry go to town on the breakfast burrito even after he falls down and the burrito gets all wet. The people in the parks department might like each other and do good for others, but man is it satisfying to watch them just rail on one guy for the silliest, most arbitrary reasons. Cathartic, even. The rest of the episode was pretty on-point, too. I'm not the hugest fan of Ann—she's always just so…unemotional about things—but I felt pretty bad for her tonight. How great was it to watch her lose the Andy attention battle to April? Andy's finally over Ann, and I got to watch, with glee, as he demonstrated his new band name "Scrotation Marks", buys April a muffin that "tastes like a rug", pass out at the hand of Ron "bean bags" Swanson, and even antagonize Mark even though, as I said, he's over Ann. He's so simple-minded, just like Jerry. Why is it I like the one guy so much more? Some nice Pawnee touches tonight: the Sweetums snack stand, and the host of Pawnee Today taking her job way too seriously. "No, that's Mr. Funny Noodle, and his drummer shot him." "Oh, Jerry, the black guy with the Looney Tunes tie?"